Picture your superintendent, school board members, parents, teachers and other stakeholders receiving an e-mail from you with an attachment. They click on the attachment and within seconds begin to listening and watching a digital story describing how you systematically and collaboratively had an impact growth and achievement among your students. They enjoy the show better than reading about it on paper, and you love it because it takes less time and is more fun to create. Download accompanying handouts. 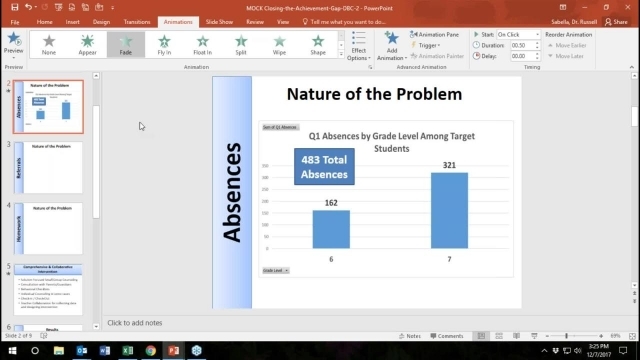 Create, copy and drop charts into PowerPoint to tell your digital story. Convert your report to video and upload to social media or video viewing platform (e.g., Vimeo or YouTube). Russell A. Sabella, Ph.D. is a professor at Florida Gulf Coast University and president of Sabella & Associates. He is author of numerous articles published in journals, magazines and newsletters and the co-author of two books, “Confronting Sexual Harassment: Learning Activities for Teens” and “Counseling in the 21st Century: Using Technology to Improve Practice.” He is also author of the popular “SchoolCounselor.com: A Friendly and Practical Guide to the World Wide Web,: (2nd edition; Educational Media; 2003), “GuardingKids.com: A Practical Guide to Keeping Kids Out of High-Tech Trouble” and well-known for his Technology Boot Camp for Counselors workshops conducted throughout the country. Sabella is a former ASCA and Florida School Counselor Association president.